Always seduced by the words, Adriana graduated in Literature and started her professional career as a Translator. Her words urged to burst out, and besides "painting" them on the canvas, she also tried to voice them. Enchanted with the result of her exploitations, she studied a way to amplify her horizons, and then she met Lee German (Arbordale): "We have so much enjoyed working with you. I actually have asked all of our other language audio recorders to listen to your Portuguese to understand what we are looking for in terms of enthusiasm and how to read with warmth, excitement, and fun to a child". 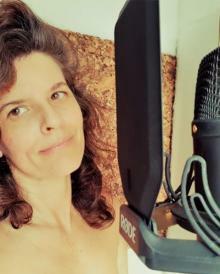 Working as an audiobook narrator for Arbordale Publishing made her understand what her mission in life really is! Other partnerships include Deyan Audio, Talat Co., Aspiring Minds, MetaLanguage, Tech World, Kunal Narayan Uniyal, FCi MS, Connie Rossini, Babelcube, Folio Online.